Kagan's FREE Articles - Be What You Want to See! Be What You Want to See! This expression was first uttered to me by my wife, Dr. Jacqueline Minor, Director of District Implementation for Kagan Professional Development. I am not sure where she first heard the saying, but from the moment she voiced these words, they stuck with me. Be what you want to see! What a marvelous mantra for those of us in a leadership role, particularly when it comes to issues surrounding student engagement. It is critical for leaders to send a consistent message to staff. What is more impactful to our teachers is not what we SAY but what we DO. Staff members pay attention to our actions. This is critically important in the realm of engagement. When we say to teachers that we value student engagement but lead meetings during which staff members passively sit, we send an inconsistent message to our team. Be what you want to see! If we value student engagement, we need to engage our staff in meetings. How do you do that? Well, of course, I would recommend attending the Cooperative Meetings training. This is a powerful workshop for leaders. 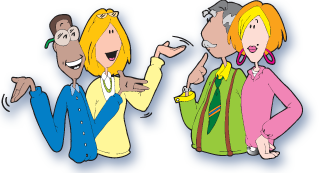 In this training we demonstrate how to use Kagan Structures with adults in three domains—Relationship Building, Professional Development, and Shared Decision Making. We also discuss various other issues that are pertinent to leading collaborative, interactive meetings (e.g., room arrangement, faculty teams, relational trust). While this workshop would certainly be of benefit, even without this training you can make your meetings more engaging. Start by attending the cooperative learning training with your teachers, and then use the Kagan Structures that are introduced in the workshop during your meetings. For example, in the day one training we discuss the importance of classbuilding and teambuilding. The structures learned on that day of training can also be used in faculty settings. Staff members can experience for themselves the power of community building. Consider the examples below. Describe your favorite “me” time. Create a list of adjectives that describe your department or grade level. Use the “All About Me” question cards on page 10.6 of the Kagan Cooperative Learning book. However, Kagan Structures can also be used to discuss issues of educational significance. In the cooperative learning training we emphasize the value of processing information frequently. Teachers can experience how critical this is to learning as they process important information related to their profession. Highlighted below are illustrations. What do you feel our school data is telling us? Brainstorm strategies to use with disruptive students. Discuss an article read by the staff or a recent decision made by the department of education. Will you be perfect with the Structures? Perhaps not, but your staff will respect your willingness to take a risk and venture into new territory, which is exactly what you are asking them to do. Know this—every time you use a Kagan Structure in a meeting with your staff, you are accomplishing at least three purposes. First, you are functioning as an instructional leader by demonstrating a best practice. Next, you are enabling teachers to experience firsthand the power of Kagan Structures. Finally, you are sending a clear message to your staff—engagement is critically important. Be what you want to see!